On Tuesday, a group of teens at the Kids in Transition residential facility in New Jersey received a special visit. The Lost Dogs author Jim Gorant, former Michael Vick dog Hector, and a rescued Pit Bull named Sarge stopped by. Like the dogs, the young men here are abuse survivors, and they read Gorant’s book as part of their curriculum. The visit (in conjunction with Pit Bull rescue and educational organization, Animal Farm Foundation) provided an opportunity to talk about the scars of cruelty and the challenges of rehabilitation and recovery. 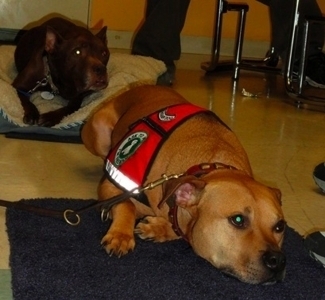 The teens were also introduced to Sarge, a sixteen-year-old Pit Bull, rescued only after fourteen long years of abuse. Sarge now lives with his two loving humans and five other canines. Like Hector, he’s a certified therapy dog and a testament to resiliency and trust. More information Jim Gorant or his book, The Lost Dogs: Michael Vick’s Dogs and Their Tale of Rescue and Redemption. More information about BAD RAP. More information about Animal Farm Foundation.